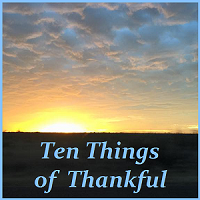 I love Nerd in the Brain‘s weekly blogging challenge to add thankfulness to my blog. This week has been a challenge but there’ve been some great points, too. Number One: Fire in the Hole! I did not set fire to a student, myself, or the classroom when we did experiments on the element carbon. Yes, it was close, but no cigar! Number Two: How old are you …? Birthday cakes are just an excuse to play with matches, especially when the kiddo has double digit candles. Whee! Number Three: Tooth Fairy Time. At my age, I don’t want to be losing teeth, but how adorable when it’s your baby teeth! This sweetie is losing the other top front tooth now, so I wonder how she will eat and speak! Somehow we all survived this. And some of us got rich in the process. I just finished reading the third of Kerry Wilkinson‘s Jessica Daniel series and can’t wait for the fourth (and final- for now). Wilkinson, a British author, has written real winners with this series. The Killer Inside is a clever thriller with believable characters and no need to suspend disbelief. Jessica Daniel is a detective who just won’t give up; she is passionate about justice and has such a clever mind. Wilkinson has created a strong young woman with a fairly normal past and present. She faces many challenges in The Killer Inside, including apparent random serial murders occurring in locked homes, along with other professional and personal issues. I couldn’t stop reading and was thrilled to discover the rest of the series. Plus, I identify with her approach to paperwork: falling stacks of paper but she knows where everything is. Read this book and you’ll be hooked! No, I did not make this chess cake, but it was delicious! Not at all bittersweet in taste. Thanks, Jennifer Nichole Wells, for your Color Your World challenge. … is yummy! Gotta love the color beaver. And this fudge is good for you- naturally sweetened, organic cocoa, and everything. This is my post for Jennifer Nichole Wells’ Color Your World challenge. After our recent snow event, a lot of us headed to car washes to remove brine and grime. I sat in my car, enjoying the view and relaxing after a long day. Yeah, my life is full of adventure. Here is my entry for black in Jennifer Nichole Wells’ Color My World challenge. I know, I know. This could be one of the world’s ugliest cakes. I am SO challenged in craftiness. The good news? It looks a lot like banana mania, a color in Jennifer Nichole Wells’ Color Your World challenge. I took this photo last autumn, knowing I needed 120 different colors for Jennifer Nichole Wells’ Color Your World challenge. I thought “atomic” meant a bit more explosive, but I’ve included Crayola’s subdued icon, FYI.